Admissions Open at Institute of Cost and Management Accountants Of Pakistan's Karachi Campus, Quetta and Hyderabad for the batch Fall 2018. ICMA offers admissions in different fields of study for Bachelor Programs. 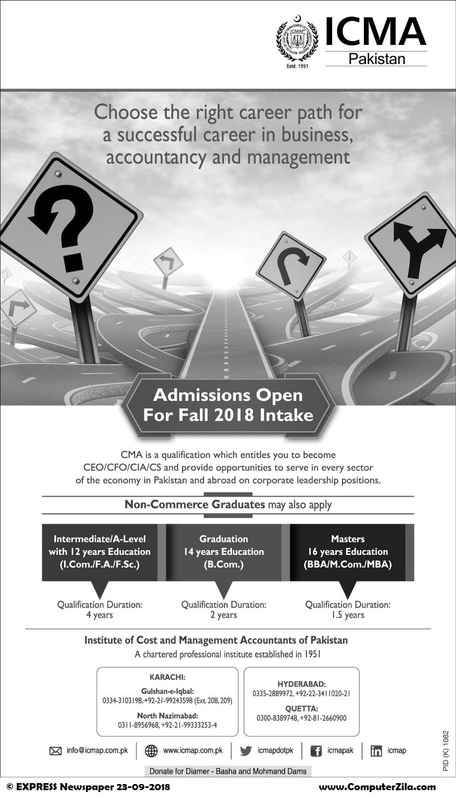 Institute of Cost and Management of Pakistan Offers admissions to become CEO/CFO/CIA/CS and provide opportunities to serve in every sector of the economy in Pakistan. University DescriptionThe Institute of Cost & Management Accountants of Pakistan (ICMAP) is a professional body offering qualification and training in management accountancy and providing ongoing support for the members. The Institute of Cost & Management Accountants of Pakistan was established in 1951 and was granted statutory status under the Cost and Management Accountants Act, 1966 for the regulation of the profession of Cost and Management Accounting. ICMAP is a full member of International Federation of Accountants (IFAC), International Accounting Standards Board (IASB), Confederation of Asian and Pacific Accountants (CAPA) and South Asian Federation of Accountants (SAFA). Campus AdressICMA Pakistan Campus Plot No. C-3 & C-8, 2nd ... Railway ECHS, Adj. Mcdonalds Auto Bhan Road, Latifabad # 3 Hyderabad.